This blog is all about my life as a lover of Books, Shoes and Writing. I like to think of myself as a diva; if only in my own mind! I was back. 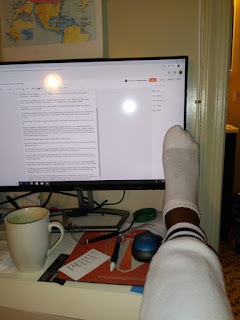 I was blogging and I was writing and then it happened. My last blog was on Aug. 27; almost a month ago. Before then, I had been chugging out a blog every week for a couple of months. I was actually writing two or three blogs at a time and scheduling them. Suddenly, I was in a funk. You know the kind. Where you don't want to write, where you don't want to read, where you don't want to do anything but stay in bed; with the covers over your head and wait it out. With that wave of funkiness over me; I began seeing more and more posts about 'feeling blue'. Coincidence? I don't think so. As a writer, my writing is my outlet. When I begin to feel blue; I write. When I feel like crying, I write; when I feel like being in bed all day, I write. But this time it was harder to shake. It was harder to overcome the urge to stay in bed. It was harder to feel like writing, or reading or doing anything but lay in bed. Only this time, the surgery was harder on my body. I woke up in more pain than I was before going in. My new condition is called CRPS or chronic regional pain syndrome. It is a painful disease that causes swelling, pain, and burning in the area of an injury. In this case, my ankle. It causes radiating pain, throbbing pain and the pain is NEVER ENDING. There is NO cure once this syndrome has developed. The only thing they can do is 'manage' it with nerve blocks, or an electrical device placed in the epidural space of your spine. Every day I wake up with pain. On a scale of one to ten; its starts with a 15 and by the end of the day, its about a seven. So on the days I'm feeling blue; its because the pain has won. The pain has gotten the better of me and all I want to do is stay in bed, heavily medicated, with the covers over my head. All I want to do is take the pain away. If someone could massage my ankle; all day, I'd be in heaven. See massaging it; although painful at times, makes it better. But I can't have a massage all day so I have to medicate; all day. Which I hate. So, although I am now out of my 'blue' feeling; my pain is still there and I am still dealing with pain. 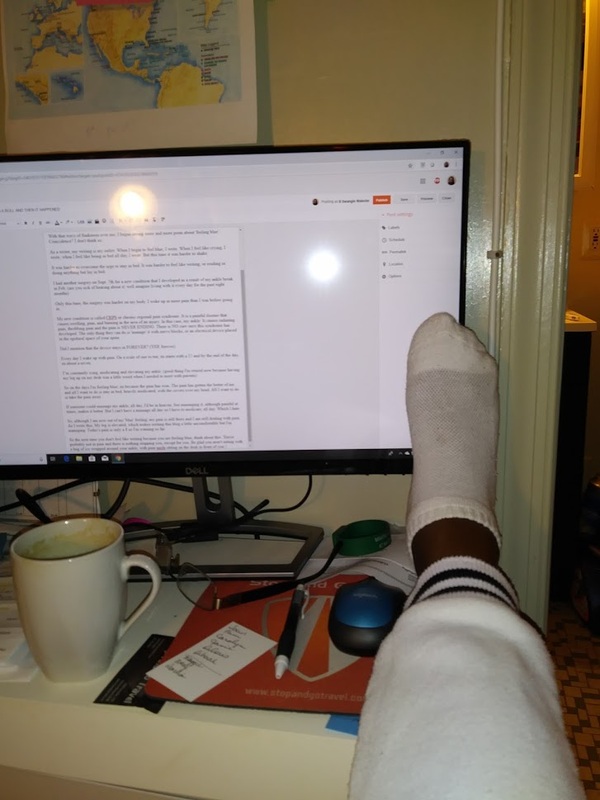 As I write this; My leg is elevated; which makes writing this blog a little uncomfortable but I'm managing. Even having a sock on makes the ankle swell so bad that I can barely remove the sock. Today I am winning because today's pain is only a 8. Score! So the next time you don't feel like writing because you are feeling blue, think about this. You're probably not in pain and there is nothing stopping you, except for you. Be glad you aren't sitting with a bag of ice wrapped around your ankle, with pain meds sitting on the desk in front of you.